Water Hyacinth has a purple flower that extends above the rest of the plant. Water Hyacinth is most readily identified by the tall purple flowers that grow off of a long stalk that extends the flower above the rest of the plant. Water Hyacinth is a floating plant, so it uses its dark roots that are not attached to the lake or pond bed to gather nutrients from the water. Their large glossy leaves stick out of the water to act as sails for the plant. Water Hyacinth is often mistaken for Water Lilies, which are a rooted plant with flatter leaves and paler colored flowers. 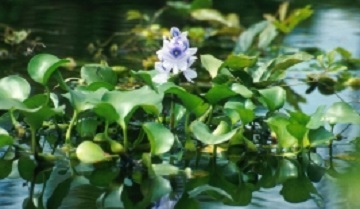 Water Hyacinth will cause oxygen depletion if allowed to cover whole surface area of water. Among the southeastern United States such as Florida, Louisiana, and Eastern Texas. Dibrox® herbicide can treat water hyacinth. These products can be purchased on our website.